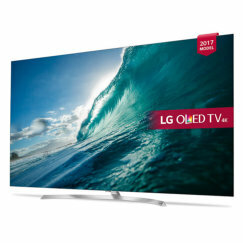 In a nutshell: The LG 55UH850V UHD HDR TV is an excellent choice for family viewing, with a big 55 inch screen and support for the Dolby Vision and HDR10 standards for High Dynamic Range (HDR). This TV incorporates catch-up TV, Netflix & Amazon streaming services, as well as YouTube, plus Freeview HD & Freesat HD tuners. With designer looks and a beefed-up sound system from Harmon Kardon, it has all the bases covered. LG's range of LED TVs has stepped up a gear for 2016, and the high-end LG 55UH850V is a very impressive starting point. Branded "Super UHD" it's a high-performing UHD TV with HDR capability, but before we start enjoying that, let's take a look at the unit with the power switched off. LG has long been a leader in style, and this UH85 model certainly looks good. Viewed from the front, it has a narrow bezel approximately 1cm wide, with smart silver metal surrounding a black inset. 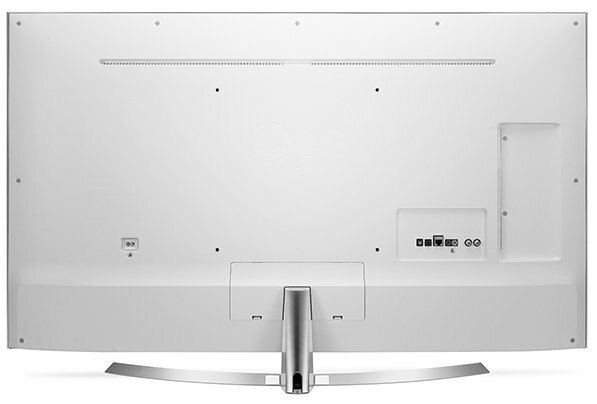 The silver edge continues around the edge of the screen, and the rear of the television has a smart white finish. 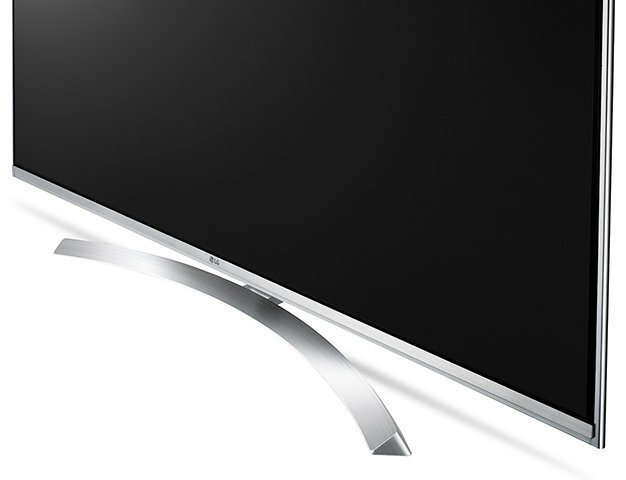 It's not the slimmest TV we've ever seen from LG, but that's probably not of great concern to most users. The screen is supported by an airy silver crescent-shaped stand that looks stylish, but is slightly wobbly, so don't let the cat jump up onto your TV shelf! The UH850V series is available in a choice of 49, 55, 60, 65, and even 75 inches. We anticipate that the 55 inch model will be the best seller. 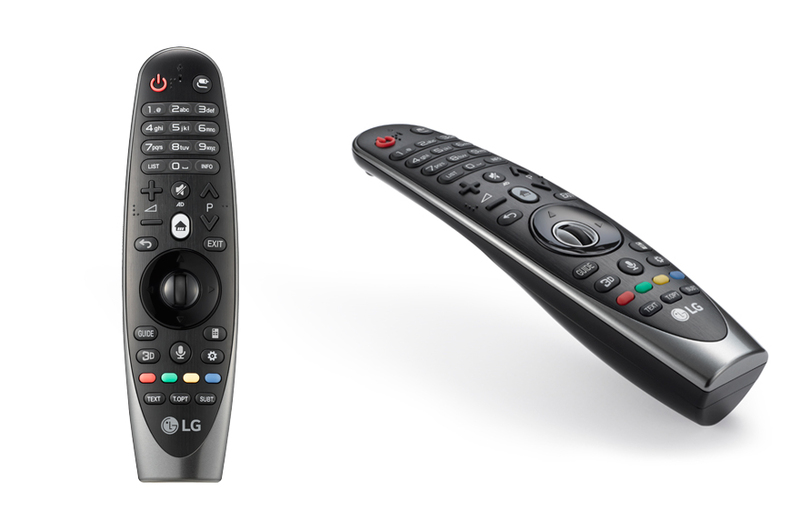 The TV is supplied with a magic remote that lets you control it by pointing, using gestures, or even voice commands. But if you prefer the old ways, you can simply press the buttons. 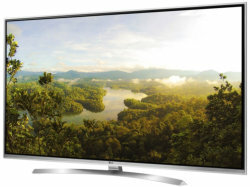 2016 sees the launch of LG's "Super UHD" range of LED TVs. We don't know exactly what Super UHD means, other than it being a nod to Samsung's SUHD branding (we don't know what SUHD means either!) What's clear is that the UH850V is a UHD (4K) TV with HDR capability, and that it meets the Dolby Vision and HDR10 standards for High Dynamic Range (HDR). The screen is one of LG's IPS panels, and is very fast for an IPS display, with a native 200Hz response rate, and an effective rate of 2700Hz when all of the motion smoothing is switched on. In practice, this can result in unnatural over-smoothing, and we'd recommend that you don't switch on all of the auto smoothing settings. The Screen is very bright, making it well-suited to daytime viewing, although it is slightly reflective, but like many IPS screens, it doesn't quite reach the depth of blacks that rival VA-type screens are capable of. Instead, it produces a slightly softer colour palette, that many people seem to prefer. 4K source material is displayed vividly and sharply however, and is a pleasure to watch on this 55-inch display. HDR source material is still rare, although Amazon and Netflix will be streaming HDR content this year. The LG 55UH850 meets the required standards, thanks to its use of quantum dot technology and a 10-bit panel, although its edgelit backlighting system does limit the extent to which the backlighting can exercise local control over brightness. As we've come to expect from LG's IPS TVs, the viewing angles are nice and wide, with very little loss of brightness or contrast in our test when viewed from the side, making this a good choice for a family TV. Unlike Samsung, which has dropped support for 3D from its entire 2016 range, LG is continuing to support 3D, at least in its more expensive models such as the UH850V. The TV comes with two pairs of passive 3D glasses. The TV performs well in 3D, with Full HD resolution, minimal crosstalk, no flicker, and plenty of brightness. LG has uprated the audio system of the 55UH850V compared with last year's 55UF850V, equipping the TV with a Harmon Kardon 2.2 speaker system. 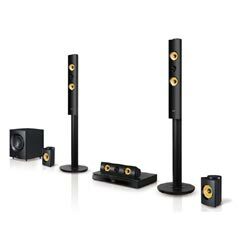 This consists of stereo speakers with subwoofers to provide much-needed bass, for a total power output of 40W. It's a big audio system for a big TV, and is significantly better than many rivals. 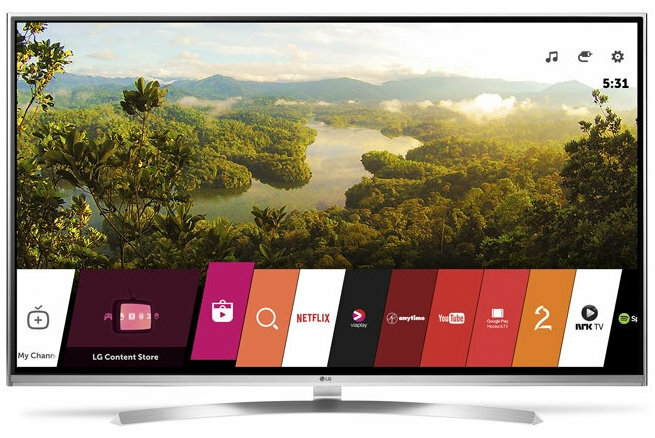 The TV uses LG's latest WebOS 3.0 operating system to provide a raft of Smart functionality. From the menu you can select channels, access catch-up TV and on-demand content, and install a range of apps. You can also control devices such as a Blu-Ray player or home cinema system from within the WebOS user interface. Catch-up TV services include the BBC iPlayer and Demand 5. There's on-demand content from the LG Content store, Netflix 4K and Amazon Instant Video. You'll also find a web browser, social media, YouTube, and access to apps from the LG Store. The TV comes with built-in Wi-Fi and an ethernet connection, for connecting to the internet and your home network. There are 3 HDMI connections, one with ARC compatibility. Three USB ports are provided, one of which is USB 3.0. A range of legacy AV connections are also available, including SCART, component & composite inputs, and a digital audio optical output. 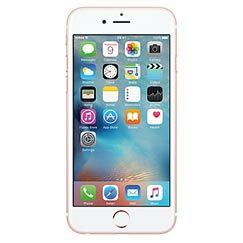 The TV supports network file browsing, and Miracast wireless sharing with compatible smartphones, tablets and other devices. It also has Bluetooth support for a wireless keyboard and mouse. You'll find both built-in Freeview HD and Freesat HD tuners here. With an optional USB disk you can even record programmes, although as the TV lacks twin tuners, you cannot watch one programme while recording another. The LG 55UH850V is an impressive start to LG's 2016 range of LED TVs. It's a highly-capable all-round performer with no real shortcomings. This would make an excellent TV for a family, thanks to its big screen, wide viewing angles, bright display and UHD HDR capabilities. All the family essentials are here - including twin tuners, catch-up TV and streaming content from Amazon and Netflix. The sound system is better than average too, and the inclusion of 3D is a welcome bonus. 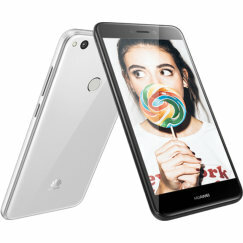 At launch, this model is priced at around £1,800, but last year's equivalent model launched at the same price and dropped significantly as the year went on, and we expect that to be true of the LG 55UH850V too. Watch out for Black Friday deals. Why does Playstation4pro state that HDR is not suppoted on TV? How can I screen image to my PC other than Miracast (not compatible)? Why 3D is blurring even after using settings and good quality 4k 3 d videos? The 3D has to be watched head on at eye level ....not to one side or above ..this is why i wall mounted mine and then i can adjust to the right viewing angle .hope this helps . Great audio, great daytime picture. All round great tv but, just for one issue. 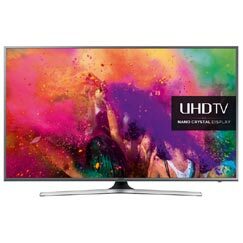 Watching any type of film in hd makes it look like a documentary and hanging all settings won’t make it look like a standard led tv. That my only issue. I paid approx £750 in 2017 brand new. Great TV which does what it says on the tin, however, I have noticed that on light to bright pictures, it looks like someone has whitewashed behind the picture with a bad brush, or a rag. I can even see what looks like finger marks as well. This is obviously a manufacturing defect, and the TV is going back today hopefully for a new panel to be installed. No, this is not the normal failure lines in the picture as happens with Led.LCD screens, but vertical shadowing on the whits panel behind the picture. Great TV, with best picture & sound quality. However, I cannot seem to record programmes. Can anyone explain how I can do this without buying a seperate recording unit. You can plug into a USB port an external hard drive or high capacity USB stick(about 128GB would be best), and you can record from freeview or freesat. Takes a while to appreciate how many features this has and to get the full use but a very nice TV. Watching Bluray video is like looking through a window. I normally download standard content, not 720p or 1080p, but I just might in future. Upscaling is awesome. Not blocky. It's got Netflix and Amazon and... I don't pay for stuff, that's what my internet connection is for! Aesthetically beautiful, full of features and performance. All perfect. Do not have sencor for light in the rom? ?